Extraordinary Creatures is an 8 part song cycle that celebrates magical creatures from ancient folklore and myth. Boggarts, Lorelei, Dragons, Fairies, creatures of earth, water, fire and air, amuse, enchant and terrify audience and singers alike. On this page you can purchase Extraordinary Creatures sheet music in PDF format. 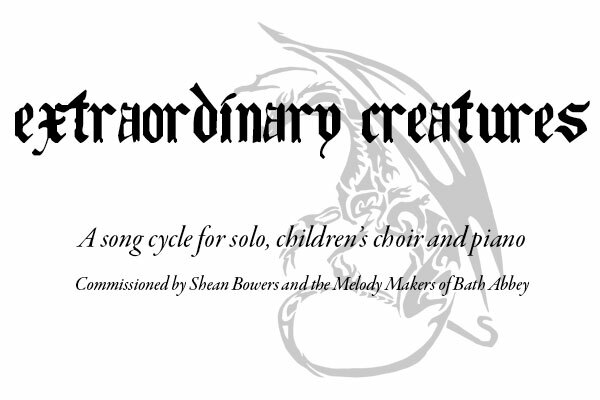 Extraordinary Creatures, a song cycle in eight parts, was written for – and is dedicated to – The Melody Makers of Bath Abbey. This was a way of saying thank you for the magical performance they gave in the premiere of The Cool Web: A Robert Graves Oratorio, at Bath Abbey in October 2014. Their voices, their dedication, and their enthusiasm all make them a joy to write for. The cycle begins with six songs celebrating creatures of Northern European folklore; beings of Earth, Water, Fire and Air; the Troll and the Boggart, the Kraken and the Lorelei, the Dragon, and the Fairies. They are splendid, treacherous and terrifying beasts for the most part, except for the funny little boggarts and the kindly fairies, and both fun and exciting to sing about. After the Mediaeval legend of the Unicorn tamed by the Maiden signifies the coming of Christianity, the cycle ends with the arrival of the Angel who banishes imaginary monsters and fills all creation with light.